Week 9: Advertising, Advertising… and More Advertising! This week was a nice refresher for the advertising and marketing breakdown. Native ads are very deceptive but I think they are very effect for the short term sense of where the future is actually going. Nonetheless, the Sponsored content is just as deceptive but it does get to the point that the advertiser wants and seems to be something people would click on. I think that the digital advertising industry is always changing and the data science avenue portion is a very essential key to progressing with knowing where the future of the industry is really going. The advertising and marketing industry is headed toward a very analytical and very compartmental breakdown for companies and products to be placed, presented and sold. I worked in radio sales and there was a ton of advertising and marketing behind the sales aspect that I did not expect. (I am extremely happy to have gained that knowledge) However, it can be such a variety of elements that are understood as advertising and marketing when selling it to the customer. From NTR (non traditional revenue) to digital, radio, tv, on-site, endorsements, etc. I mean this literally can go on and on because if you can think it and coordinate people to do it, you truly can sell it. But I am extremely thrilled to share my case study in the next couple of weeks so stay tuned. This week was rhetorical on the newspaper and transitioning to the digital age. However, the asynchronous session was super interesting to bring up the citizen journalism (per-say) as disrupting journalist and journalism as a whole. 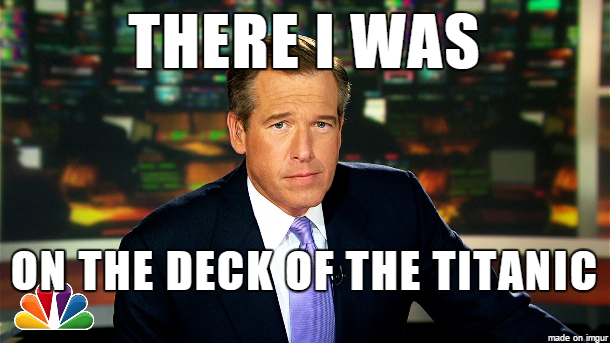 I love that we responded to this topic especially to the Brian Williams sticky situation. This actually was an ironic mishap that fell into my lap when I was trying to prove a point to my parents. I had always mentioned that I was not fond of NBC news locally for the lack of accredited information they reported and how they outright state things on-air without a reference or any sort of source. To circle this back to why I even brought this up… I think that citizen journalism is interesting and how they keep reporters true to being honest watchdogs. I can appreciate that. In our discussion in class this week was great with a lot of fantastic insight and topics that branch out further than just what lies ahead but what lies ahead and how will it lie ahead for journalists? I love hearing everyone’s opinion’s. It is cool to know that our class is not only the inaugural class for this program but we could be inaugural participants of a much larger movement in our future. That is it for now. Until next week. This week was crazy for me. I unfortunately missed our class due to a family emergency however I did learn that I do not know as much as I thought I did in regards to data and advertising and such that we learned this week. However I did come to terms with my take on Big Data and since I used to work as a radio salesperson advertising was a huge part of the campaigns therefore I do agree with the Big Data scenario and have no problem with the privacy issues since you have to do what you gotta do to get where you have to go.